I work with athletes of all flavors: a stay-at-home Mom training for her first marathon to lose baby fat and carve out some time for herself, a professional Extreme skier trying to keep his spine healthy as he drops 80-foot cliffs, and a 14-year-old US Figure Skating Team member who trains more hours in a day than I am even awake for. I love the variety of motivations my clients have to be athletes. I am regularly introduced to new sports (like skeleton) and constantly dive into medical journals to learn how to meet each of these clients’ novel sport and injury needs best. Recently I have met my biggest challenge. Her name is Micah, and we can all learn a lot from her about injury psychology, trusting the healing process and the importance of “homework” to get back to the things we love. Micah is a runner and, through some poor footwear decisions, developed pain in her feet. Because she was unable to continue running, she saw several specialists to diagnose her foot pain. Many doctors, MRI’s, and cortisone injections later, she did not have a diagnosis or relief. She was recommended to rest and hope that the problem resolved itself; it did not. It soon became painful for her to even walk. Months of limping soon made her hip painful. This is the point where I started working with Micah and her medical team. An insightful podiatrist radically changed her footwear, which changed how her heels interacted with the ground until finally she showed signs of improvement in her feet. However, as her feet improved, her hips got worse. I surmised that all the gait alteration to escape the pain in the feet required new and novel uses for her hip joints. I released the tight and overused muscles in her hips, stimulated the muscles that were not pulling their weight, did gentle joint gliding for the hips and lower back to encourage synovial fluid production (lubrication for joints), and introduced lateral movement into Micah’s rehab work to strengthen her atrophied muscles. I was glowing as a therapist after this first session. Micah was in the least amount of pain that she had been in for months, and she was finally hopeful she would return to racing on the trails again. The next morning I received a panicked phone call from her mother. Micah was worse, much worse! I reviewed the therapy I had done with her and was completely confused; at worst she should have had no change in her pain but be a little touch sensitive in the muscles I released. We talked further and I learned that Micah felt so fantastic after my work that she promptly ripped around in the foothills with her friends that evening. She believed that since she felt good she could go back to doing everything she did before, right away. Even though I explained to her during our session that she would feel better, a slow and methodical return to activity was essential. This often is ignored by clients as the thrill of experiencing some improvement is seductive. There are muscles to strengthen and movement habits to change that will take time and practice, plus some tissue healing that will take about six weeks to complete. We set up an immediate follow-up session. During our second session I spent considerable time with Micah teaching her the strength and movement exercises necessary to properly restore her hip biomechanics, showing her which tight muscles could benefit from self-massage, and some stretches to promote a full range of motion. After our session I believed Micah understood the process to get her hips healthy again and a realistic time-line for returning to sport. A few days later I received another call from Micah’s mom. This time, Mom was laughing! Mom shared with me that I must have gotten through to Micah as she was going out of her way to show her the exercises she was doing, and was doing them almost every chance she got. Relieved, I saw Micah again to further therapy. This time Micah had to show off. She spun in circles demonstrating the lateral movement exercises I had asked her to practice; she did a forward fold placing her head between her legs to open up her hips, then went over to a piñon tree and pressed her hip into a knobby branch she obviously had pruned so she could do some self-therapy. I was amazed; Micah is a horse! It has been a bumpy road, but Micah is back to racing around the trails with the heard. 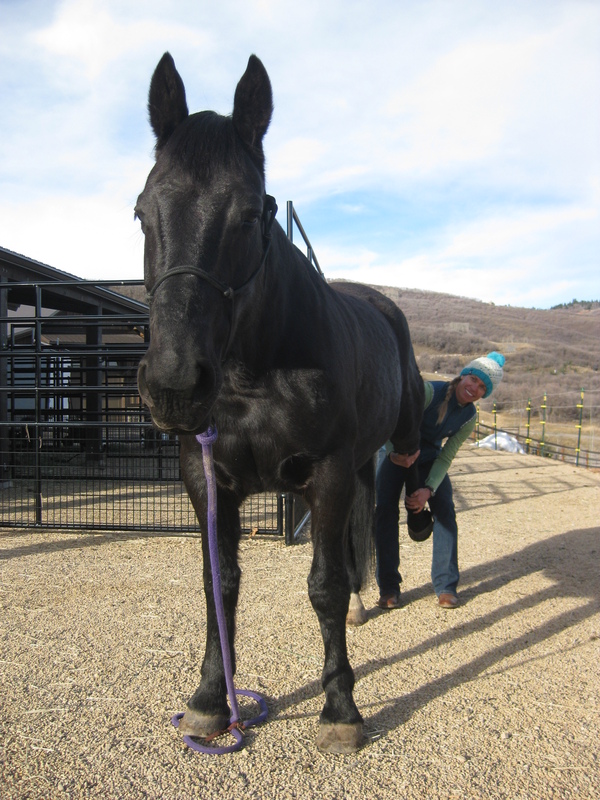 Even though Micah is a horse, her healing process from a frustrating injury is the same as yours and mine. Injuries can be tricky to diagnose. It often takes a few visits to various health care providers to figure out how to get an injury healed, and often there are multiple factors contributing to the pain. Often it takes a team of “experts” to come up with a plan. When finally we see some improvement, it is difficult not to overdo it and set ourselves back. Patience! Being an active participant by doing your “homework” and becoming educated about your injury and healing process is essential. 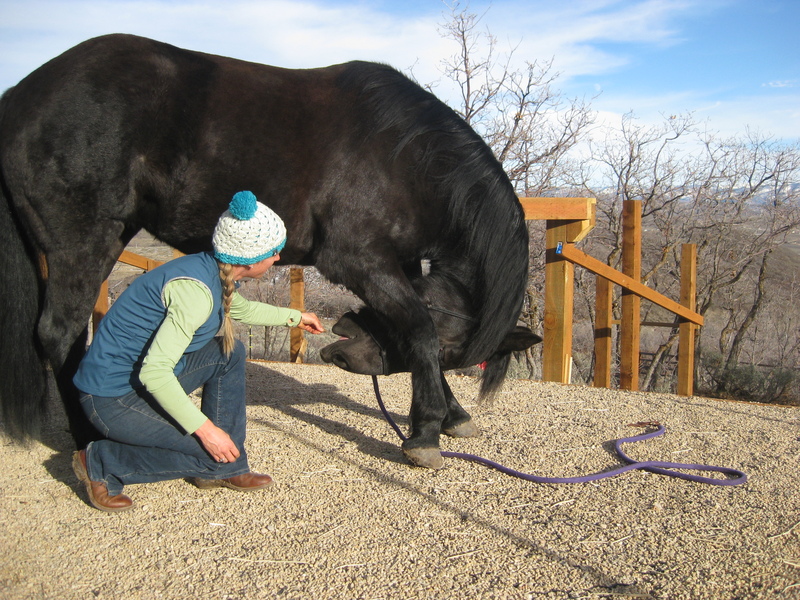 Micah is my first equine therapy client, and it has provided an incredible learning experience for me. I am available for other equine sessions; call Focus Bodywork if you would like to know more about my credentials, what is involved in a session and rates. This entry was posted in Clients, equine therapy, Running, Sports Injuries, sports spychology and tagged equine therapy by focusbodywork. Bookmark the permalink.